Course Trainer: Friedhelm Rump , Library of the University of Veterinary Medicine Hannover. Friedhelm Rump holds a diploma (1973) and a PhD (1978) in Geochemistry from Göttingen University. He undertook his library training at Göttingen University Library and Fachhochschule für Bibliotheks-und Dokumentationswesen in Köln (1980 -1982). He has held positions at the Göttingen University Library, the Municipal Archives of Göttingen and Hohenheim University, Stuttgart. Since 1990 he has been library director at the Veterinary University of Hannover. He has held a number of honorary positions. He is very active in EAHIL and is both treasurer and spokesman for the European Veterinary Libraries Group. The course focuses on three search skills, search tools and special resources. The aim is to provide an extensive overview of what exists on the internet and how to use it effectively. The expected level of expertise for participants ranges from basic to intermediate. The contents of this course will be available on a CD which will be given to participants free of charge at the end of the course. Liz Blankson-Hemans is Director - International, Information Professional Development, at Dialog, a division of Thomson Scientific. She manages the deployment of Quantum2 (Dialog’s Leadership Development Programme for information professionals) in Europe and Asia Pacific; the Dialog Customer Advisory Board for the International region, and the Graduate Education Programme outside North America. She also coordinates the company’s interactions with professional groups such as CILIP, CiG and the Special Libraries Association (SLA) in Europe and in Australia/New Zealand. She was president of SLA Europe in 2004-2005, and also sits on the SLA’s Diversity Leadership Development Programme committee. Librarians have usually been diligent in measuring operational indicators such as requests, loans, transactions, search sessions, and so on. Such measurements should continue to be done, but it is critical to measure the right things and to interpret the numbers for meaningful indications of changing needs. Measuring and analyzing library activity is not everything, however. It is equally important to measure impact. Measuring impact involves charting metrics for deriving expressions of the library's value in monetary terms, or from demonstrable benefits such as reduced turnaround time, improved accuracy, risk avoidance, and the like. The emphasis of this workshop is to show how the use of externally purchased content or services in planning for the content requirements of the organisation can help define the impact of the information centre in supporting key business initiatives. It layers on the other ROI concepts within the Quantum2 framework and offers the “big picture” view on how to help the information centre justify its costs and ultimately, its existence. In justifying costs for the information centre, the inevitable trade-offs in time, cost and quality, during the budgeting process will also be looked at. Hilde Strømme has worked in different Norwegian hospital libraries since 1996. She is currently employed by Ullevaal University Hospital, where she is head of the Medical Library’s user education programme. Hilde Strømme is also chair of the Norwegian Library Association’s Section for Medicine and Health and a member of the EAHIL Council. There are numerous free medical resources on the Internet. Some are useless, others very good. In this course we will look at a few of the good ones. We will focus on resources for evidence based practice, clinical guidelines, free medical journals, and free medical databases. Please note that this is not a course in database searching, but you will get a few tips about some of the databases that are available. This course will not cover everything, just a little bit - a useful bit. The course will be a combination of demonstrations and hands-on-training. Patricia Flor qualified as a librarian in 1970 and has additional studies in management and in computer science. She has worked in medical and health care libraries in Great Britain, West Africa and Norway. At present she is head of department at Telemark University College Library and has special responsibility for services to health care studies. In 2003-2004 she led a project for the development of a web-based guide in information literacy for students, råd&VINK. She has been active in EAHIL for many years and is one of the council members for Norway. She has also taken part in continuing education committees and international programme committees for several conferences and workshops. There are many web tutorials in information literacy freely available on the Internet. Even so, they may not suit the needs of our users or have an approach to teaching and learning that is conducive to our way of thinking. Anny Gry Skonnord qualified as a librarian in 1988. She has worked with e-journals at the library of Medicine and Health Sciences, University of Oslo, Norway, since 2001. Daily management of an increasing number of electronic journals: How to get started. This course is aimed at librarians with little or no experience with e-journal management. Astrid Muller is librarian at the Library of Medicine and Health Sciences, University of Oslo, Norway. In addition to giving courses in PubMed, she is also webmaster of her library and participant in the library portal project of the University of Olso Library. Paul trained as a librarian and spent six years working in libraries before joining 3M in a sales and marketing role. He worked for Swets and Zeitlinger for fourteen years and between 1994 and 2003 was the Managing Director of the Company in the UK and Ireland. During his last year at Swets, Paul Harwood was responsible for the Company’s global Consortia and Multi-Site Services Team, helping academic consortia and global corporations broker electronic deals with scholarly publishers. A member of the UK Serials Group Committee since 1995, he is currently Treasurer having also served spells as Marketing and Education Officer for the Group. Carolyn has been in the serials information industry since 1988, when she joined the UK office of The Faxon Company as Customer Services Manager. In 1994 she became Sales Manager (Academic & Pharmaceutical Sectors) at Swets UK. She joined Content Complete Ltd in April 2004 as Content Negotiator. Since joining Content Complete, Carolyn’s work has revolved around negotiating preferential access rates and licensing terms with publishers on behalf of NESLi2 (representing UK Higher and Further education institutions), IReL (representing the 7 Irish universities) and for the major pharmaceutical corporation GlaxoSmithKline (for ‘enterprise-wide’ electronic access). This Course is designed to help librarians and information professionals in handling negotiations with online journal publishers. It will be led by Paul Harwood and Carolyn Alderson from Content Complete Limited and is based on the experiences of the workshop leaders in negotiating with publishers on behalf of academic consortia and multi-sited global corporations and a range of other clients in the public and private sectors. The workshop adopts a chronological and systematic approach to the process of negotiating with publishers, from identification of the content to be licensed through to post-negotiation issues and service fulfilment. It includes some practical exercises and group work. The workshop will be of interest not only to those individuals just setting-out on the negotiations path but also to those who wish to benchmark their own negotiating strategies and approach with others. Lillian Kozuma is employed at the National Library of Medicine and has over thirty years of experience with conversion of manual resources to digital formats for public access. Ms. Kozuma served as Project Officer for conversion of the NLM Card Catalog and the Index-Catalogue project. Her experience includes writing of user search manuals, Web documentation, teaching librarians search techniques for CATLINE (predecessor to LocatorPlus), instructing staff on NLM’s ILS system, and development and presentation of an IndexCat course for the 2004 meeting of the American Association for the History of Medicine. Currently, Ms. Kozuma is involved in preparing Web access to A Catalogue of Incipits of Mediaeval Scientific Writings in Latin by Lynn Thorndyke and Pearl Kibre and A Catalogue of Incipits of Mediaeval Scientific Writings in Old and Middle English edited by Linda Ehrsam Voights and Patricia Deery Kurtz. In 2005, Ms. Kozuma received the NLM Frank B. Rogers Award for major contributions to NLM services. This hands-on course is designed to provide background information on the development of IndexCat as a cooperative project; To demonstrate IndexCat search strategies for subject and author access; To discuss scope and content and their relationship to search results; and To describe the hierarchical structure of IndexCat and its use for further searching. At the end of this course, participants will: a) understand the IndexCat development process; b) have more options for forming search strategies; c) be aware of specific limitations in retrieval results because of scope and content issues; and c) understand the nature of IndexCat structure and how it can assist in searching. Jarmila has worked as an information specialist in the field of agricultural research for 20 years. In 1994 she took the post as medical library director at Palacky University in Olomouc. She acquired most of her information technology skills through participation in the 5-year-project Learning Resource Centers in CEE countries sponsored by the American International Health Alliance focused on information technology in medicine and healthcare including evidence-based medicine. In 2003 she was granted a Certificate of achievement in the area of application of evidence-based practice, community outreach, LRC sustainability and educational technologies from the American International Health Alliance (Washington, D.C., USA). She has taken an active part in all EAHIL conferences and workshops since 1999. Her main field of interest is information retrieval, the role of librarians in EBM and teaching information skills. This course is suited for beginners to demonstrate the practical role of medical librarians in the process of evidence-based medicine. (definition, history, pros-cons, steps in EBM process, „the well-built clinical question“). Module 2: EBM Resources: Where to Search? (recommended resources online demonstration, document types, hierarchy of evidence, availability)..
Module 3: Finding the Best Evidence: How to Search? (Sample MEDLINE Search via PubMed, application of limits, MeSH terms, LinkOut option. Narrative vs. Systematic reviews). Module 4: Cochrane Collaboration: Activities and Products. (Cochrane Library sample searches, typical features of Cochrane systematic reviews). - Interactive Searching via Ovid Gateway. Module 5: Tips for Assessing the Value of Medical Literature. (Bibliometric tools – SCI, journal IF, Critical Appraisal Skills Programme – CASP International, quality criteria for medical websites). Required Reading List for Participants of the Course. For a digital copy of articles 2-4 please contact potomkov@tunw.upol.cz..
(1) Bhandari M., Zlowodzki M., Cole P.A. (2004) From eminence-bassed practice to evidence-based practice. A paradigm shift. Minnesota Medicine 87(April). Online. http://www.mmaonline.net/publications/mn-med.cfm. pneumococcal vaccination for prevention of otitis media. Pediatr Infect Dis J 22(6):515-524. (4) Pelton S.I. (2002) Acute otitis media in an era of increasing antimicrobial resistance and universal administration of pneumococcal conjugate vaccine. Pediatr Infect Dis J 21(6):599-604. Ronald van Dieën completed Library School in 1988. Since then he has worked as the head of several medical and psychiatric libraries. Co-founder of the Central Catalogue of Hospital Libraries in the Netherlands and is former chair of the Dutch Medical Library Association (NVB/BMI). 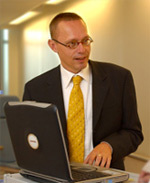 In 1998 he became general manager of EBSCO the Netherlands. Since 2001 he has worked as a medical library consultant for Ingressus. He is stimulated and motivated by sharing ideas, experiences and knowledge with other library professionals. Hans Ket (1964) has had a varied career starting with Library School in 1985, working as a librarian for an aircraft factory, art school, Dutch Medical Association, University of Utrecht's psychological test department and nursing school library. In between all of these he trained as a nurse. Since 2003 he has been a clinical librarian at the Vrije Universiteit Medical Center (VUmc) in Amsterdam. As a CL he is actively involved in supporting and delivering information sevices for clinical practice, medical education and health & clinical research, especially in the fields of allied health, nursing, medical psychology, gynecology, pediatrics and ophthalmology. He is a keen, although fairly recent, attender of EAHIL and HTAi conferences and workshops. On a national level he is active in promoting clinical librarianship and giving presentations to fellow librarians. He is very interested in finding out about the experiences in the information field from librarians as well as medical professionals. He enjoys giving instructions, courses and classes of all sorts to various groups in the medical and the library field. Medical librarians have to start selling themselves. The library and its staff are under pressure from hospital management: decreasing budgets, bad image and the general opinion that everything can be found on the Internet for free. Library staff themselves highly influence the impression and opinion of users and management about the library. Increasing demands from users and management within institutions on one hand, and a fast changing information world on the other hand, demand rapid action and innovative approaches from librarians. A business like model and the fast increase of electronic resources are catalysts for the changing role of the medical information specialist. Clinical librarianship in different forms and shapes is rapidly evolving. Based on theoretical and practical experiences of both presenters we present library models which will be able to handle these new demands. Various techniques, approaches and most important the concept of clinical librarianship will be clarified, discussed and evaluated. At the end of the workshop the delegates will be aware of their changing role and have received tools to stand up and fulfil their new role. Please join our workshop and share your ideas, experiences and fears with us! Eve Hollis began her library career as a library assistant at the Nuffield Orthopaedic Centre, Oxford. Her first career was medical radiography, which was a useful background for a medical librarian. Since 1995 she has been the Library Services Manager. Learning never stops and she has attended numerous seminars, workshops, conferences and trainings, and she has found that most of them, while interesting in content are usually profoundly dull to sit through, often leading to afternoon snoozes. Learning should start as fun in the nursery and continue to be enjoyed when discussing one's pension. How do you eat an elephant? One slice at a time! The same applies to digesting difficult to understand or boring information - one bit at a time. Information overload in presentations will only lead to indigestion, failure to understand, and a dozing audience. This course will help the attendees to put together presentations of difficult or boring material and make it more interesting. It will give tips on technique, do's and don'ts, and ways of keeping an audience interested and awake. 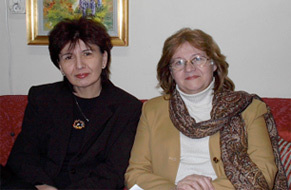 Mihaela Lazar has been an EFL teacher for more than 25 years in Cluj-Napoca, Romania. She also has wide experience as a mentor and teacher trainer. A few years ago she was appointed Cambridge presenter by Cambridge ESOL and has been running seminars for teachers ever since. Besides working for the British Council Romania and Cambridge ESOL she has kept in constant contact with native speakers, training American teachers sent to work in various bilingual schools throughout Romania within The Central European Teaching Programme. Mihaela also has a special interest in drama, especially after attending a course on Educational Drama. She has just been approved to conduct “ English for business” Oral Examinations by the London Chamber of Commerce and Industry Examinations Board. Adriana Vuscan has been involved in mentoring work since 1997, being trained as mentor trainer at Leeds University, School of Education, 1999. She has held training courses both in Romania and abroad (Latvia and Ukraine), and has been involved in several British Council mentoring projects (Presett, Support for Newly Qualified Teachers, Mentor Observation and Support Scheme). She is co-author of Portfolios for Newly Qualified Teachers and their Mentors (2002); and of Tests for Evaluating Mentors(1998). Currently she is Vice-President of the Romanian Mentors’ Association/ASMERO. Monica Marasescu is an experienced mentor trainer and has worked in the field since 1997. She was trained to be a mentor trainer at Leeds University, School of Education in 1999 and has trained mentors both in Romania and abroad. She has acquired experience developing and managing mentoring projects for the British Council: Support for Newly Qualified Teachers (2000-2002) and Mentor Observation and Support Scheme (2001-2002), and is co-author of Tests for Evaluating Mentors (1998). Currently she is Director of the British Council Centre in Cluj-Napoca, which includes a Library and Information Centre. This 2-day workshop will look at a librarian’s development within a mentoring system. We will help participants become aware of the specific skills and qualities of a successful mentor and of the mentor’s roles in assisting colleagues in their early or mid career. Participants will be invited to take part in an exciting interactive course where sharing experience and reflection on one’s practice will enhance and benefit professional communication and learning.